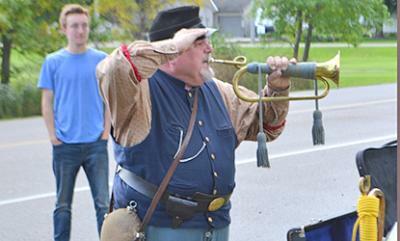 Bill Crowder, also known as “Bugler Bill,” visited Glencoe-Silver Lake High School history classes Monday, dressed in a Civil War uniform and with instruments from the era. He explained and played the various tunes played before, during and after battle, and at special ceremonies. Crowder, who lives in the Twin Cities, participates in re-enactments.